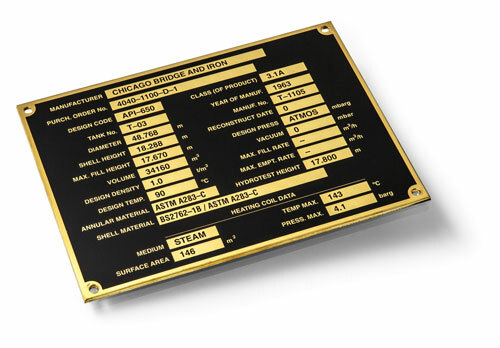 Metal nameplates offer superior durability, can be attractively finished, and are resistant to harsh conditions. 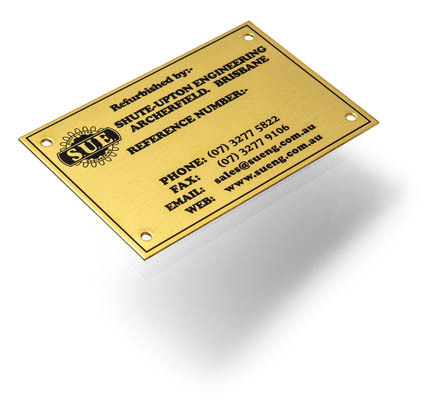 Custom made metal name plates are an excellent choice for applications where important information, for example machine rating info, company branding, load limits for products like wire ropes and chains, and general safety information need to be clearly communicated and remain legible for many years to come. Permark’s metal name plates are most commonly made from Aluminium, Stainless Steel and Brass substrates, but also from tin plate and aluminium foil. Material gauge depends on the application and such things as what mechanical strength the plate is required to have, the type of finish, and what environment the plate will be placed in. Material finish varies depending on the metal selection – visit the specific metal pages for Aluminium, Stainless Steel and Brass for further details. Many nameplates require unique or variable rating information to be printed onto the plates. This can be achieved in several ways, by printing or chemical etching, by diamond scratch engraving or laser engraving, or for serialised numbers, by sequentially stamping numbers onto the plates with a press. For higher volume applications where variable information is added to nameplates, Permark can provide management of the plates by holding the manufactured “blanks” in stock, and adding the variable information on an order by order basis as required. Contact Permark for further information. Mounting holes ready for rivets or screws can be supplied in the plates, and/or specialty adhesive backing can be applied – which are selected to suit the material the plate will be adhered to. For the most durable graphic images, Permark chemically etch images into the surface of the metal plate. Specially formulated inks are then either screen printed or paint filled into the etched plates. The plates are then baked to cure the inks. The name plates can be decorated on both sides if required. Because the images and inks are recessed into the surface of the plate, they are less susceptible to damage from surface abrasion, and because the images have been etched into the plates, even if the inks were somehow scratched away, the etched impression is still visible. Further decoration can include a clear sprayed protective coating (in particular for brass nameplates) lamination of protective film and the depositing of Resin onto the finished plates to form a domed resin nameplate is also possible..
A fair amount of science goes into making metal nameplates. Experience has shown that tight control of the parameters that create interaction between metal and chemicals to etch and anodise nameplates will result in repeatable and superior products. For anodised plates, the anodic layer thickness for each batch is measured to be certain the process has resulted in a thick hardened layer for protection. For both anodising and etching, Permark record and test each production batch to ensure consistent quality. Anodised Aluminium printed with sequential barcode and adhesive backer. Embossed, anodised & screen printed aluminium. Rating Plate made in anodised aluminium. Embossed Braille in anodised aluminium. Anodised Aluminium Nameplates – for Permanent, Durable Labels. Often used in tough environments because of Aluminium’s ability to resist high temperatures, when anodised, aluminium also provides high resistance to wear and abrasion, and is a good choice for uses where plastic or paper labels wouldn’t withstand the conditions. 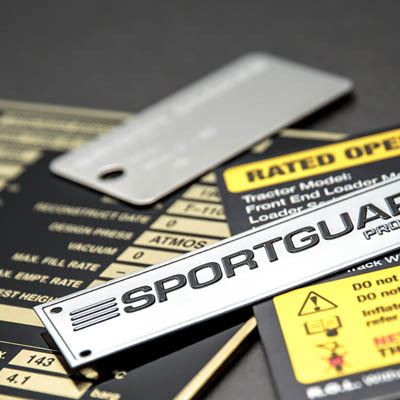 Because of the attractive finish that can be achieved along with durability, aluminium nameplates are used for a wide variety of applications, such as for branding, identifying equipment and to convey information, such as operating instructions, load limits, machine tolerance, rating and safety information. Permark have the ability to make not only name plates but parts that are printed and formed into such items as mechanical levers and switches. The etched background of the aluminium leaves the text raised in this example. Decoration of aluminium can be by surface printing with specially formulated inks, or more commonly by printing with a dye after anodising. In combination with this, aluminium can also be etched and then dye is screen printed or paint filled into the etch. Surface printing is often specified when specific PMS colours are requested, or when special inks are needed, for example to withstand high temperatures. Etching and then screen-printing or paint filling can be applied for decorative effect or when the extra security that an etched image provides is required. Will the plate be shaped? What processes will be used that affect material selection? Is the plate going to carry load? How will the plate be mounted? Permark typically use finishes that are either natural or linished (brushed). There are a number of processes available to alter finish including chemical brightening, powder coatings, and polishing processes. Aluminium nameplates can be pressed out, knifed to shape using a platen press, guillotined, or laser cut, depending on the gauge selected. Permark hold a large range of standard press tool shapes, such as rectangles and circles, with or without radius corners and mounting holes, and can also manufacture custom shaped press tools to suit specific customer designs. 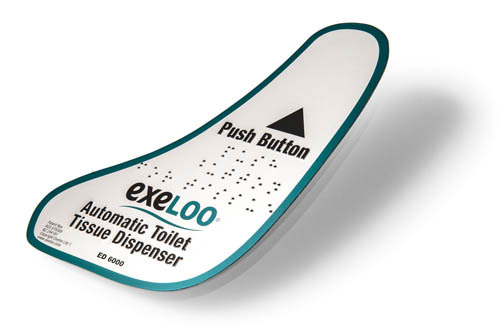 Further finishing options can include cropping of corners and pressing holes, and embossing text and symbols for decoration or function – for example Braille embossed onto the plates. Warning tab: Anodised, Screen printed and knifed shape. Mounting of nameplates is usually by screw or rivet holes that are pressed into the metal plates. For thicker gauge plates, mounting is sometimes achieved by welding directly onto units at the point of manufacture. Alternatively, or in combination with the above, adhesives can be applied to the back of the nameplates. A large range of adhesive options are available to suit adhesion to almost any substrate, for example other metals, plastic and powder coated surfaces. Most of the adhesives specified are suitable for outdoor and wet applications. The anodising process builds a thick film of aluminium oxide on the surface of the aluminium, after this a dye is screen printed into the porous layer. Once printing is completed, the pores are sealed, which traps the inks into the surface of the material. The sealing process changes the chemical composition of the aluminium, creating a hard mineral layer (Boehmite), which provides added protection from corrosion, and improves resistance to abrasion and wear. Permark ensures the anodic layer is thick enough to provide good protection by measuring the thickness of the layer for every nameplate batch of production. The resulting name plate image is colour fast, permanent and durable, whilst being resistant to marks and fingerprints, and has the appearance of a clean, modern looking label. 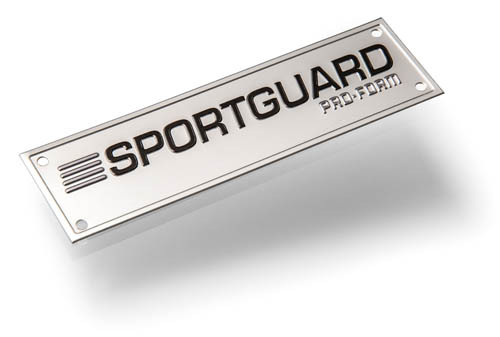 Name plates made from stainless steel offer excellent resistance to corrosion, chemicals, and staining, have high temperature resistance, and being a hard material, is resistant to abrasion. Stainless steel nameplates are easy to clean, whilst being aesthetically pleasing. 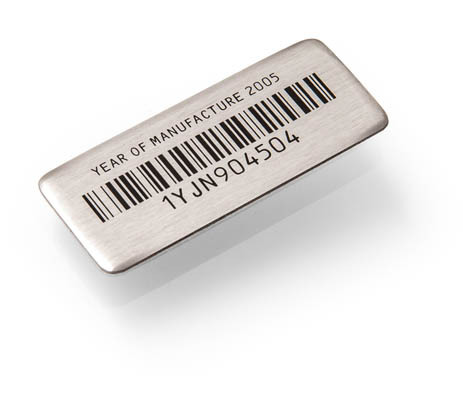 With so many outstanding properties, it is not surprising that Permark make a diverse range of custom manufactured name plates out of this material, some that are purely functional, such as machine ID rating plates which are fixed to equipment, sequentially numbered barcode nameplates and asset tags, through to premium quality items like stainless steel business cards and highly detailed etched plaques that are also printed, polished, shaped and cut before being mounted onto wood or stone. BA Stainless Steel Etched and paint filled two colours. As with aluminium or brass nameplates, stainless steel is often used to brand and identify machinery and equipment, and is more commonly specified for very harsh conditions where this strong, chemical resistant material comes into it’s own for resistance & durability. Bright Stainless Steel – etched, paint filled two colours and guillotined to shape. Stainless Steel can be either surface printed with a two pot enamel, or for more permanent durable graphics, screen printed with a chemically resistance mask, and then chemically etched, to leave legible graphics and text etched in the surface of the plate to a depth of about 0.25mm. Etched graphics and text can then be colour filled with an enamel spray which is baked into the etched surface of the nameplates for decorative effect. Multiple colours can be applied to the plates on one or two sides of the plate and specific PMS colours for branding can be specified . Laser Engraving of variable information. Stamp Embossing Unique sequential numbers. Gauges from 0.55mm to more than 3mm are available in various grades and are usually recommended by Permark to suit the application. 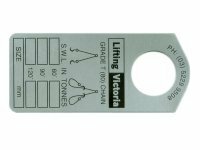 Most commonly Permark work with 304 and 316 Marine Grade Stainless Steel with BA (bright annealed) and #2 (satin) or #4 (brushed) finishes. Consideration for the following will help determine what is most suitable. Shaping the plate – will tools handle the material hardness / thickness? What other processes will be used? A deeper etch can be achieved on certain grades. Will the plate carry load? Will the plate be exposed to seawater/chemicals? 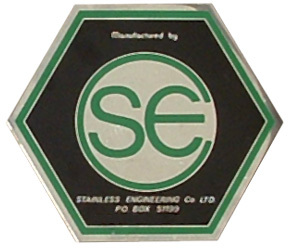 Generally stainless steel nameplates are either pressed out to a shape, or guillotined, or for small runs, or complex shapes, can be laser cut. Permark maintain a large range of standard press tool shapes such as rectangles and circles with or without mounting holes, and with or without radius corners. Alternatively, new press tools can be manufactured to customer specification. Further finishing can be achieved with corner cropping radius corners and pressing various holes and shapes out of plates. The most common method of mounting stainless steel nameplates is via screw or rivet holes pressed into the plates. 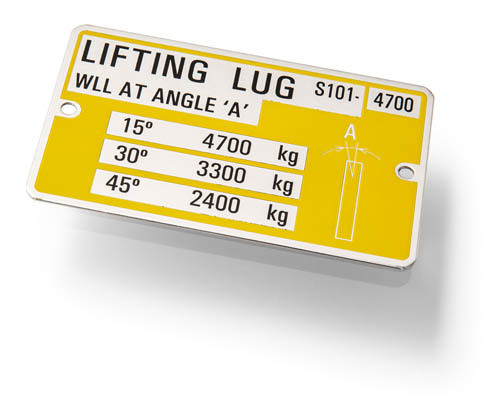 Nameplates can also be mounted by welding to units at the point of manufacture. Backing adhesive can be applied as the sole mounting method, or simply to assist with mounting plates with screws. Adhesives are specified according to the substrate being adhered to, a large range of substrates such as metals, plastics, powder coated surfaces and wet, outdoor environments can be catered for. Brass is an excellent choice of metal for making nameplates. Brass plate is corrosion resistant, will weather naturally to give an “antique” or weathered appearance, or with a lacquer applied can be made to look bright, stylish and golden. Nameplates such as the “Simmons” example shown below are used for branding of indoor and outdoor furniture and other items. Brass complements wood very nicely, and many wooden products bear brass plates with the makers name on them. Award Plaques, signs for doors and on buildings, commemorative plaques and asset tags are other examples. Because brass weathers naturally, and has good resistance to corrosion by sea salt, it is often found in marine applications, and in harsh industrial applications, such as rating plates for boilers, engines and machinery. The decoration processes used for brass nameplates are similar to those use for Aluminium or Stainless Steel. Brass can be surface screen printed, but is more commonly screen printed and then etched and paint filled, then pressed to a shape. The etching process can produce a decorative effect which leaves images and text legible, graphics can be either etched into the metal plates, or the background can be etched to leave the graphics and text raised. (The “S” and shiny surfaces of the “Simmons” example are raised). Brass Nameplates can be decorated on both sides for items such as valve tags, and can have multiple colours etched and paint filled onto them. 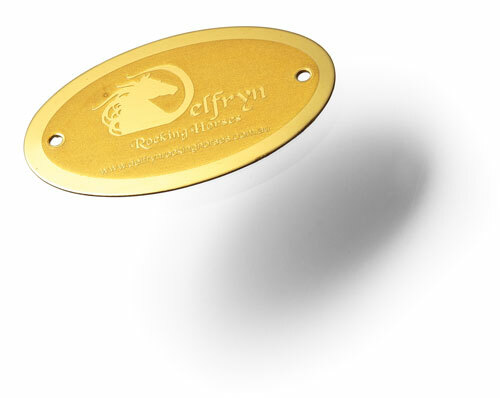 Further finishing of the plates can include applying sequential serialised number, sequential printed barcodes, and numbers which can be diamond scratch engraved or stamped into the brass. guillotined to size with holes pressed for mounting. Permark hold a large range of standard press tool shapes such as rectangles, circles and ovals, with and without mounting holes that be used to press shapes from brass. Gauges that are pressed are typically between 0.5mm to 3.0mm or more. To find out more about what shapes and sizes of press tools Permark carry, contact one of their sales team. If a specific shape is required that cannot be accommodated by stock press tools, or other methods of cutting, custom made press tools to suit client specific designs can be manufactured. Brass nameplates can be mounted onto wood using brass pins. Holes can be pressed into the nameplates in any location to accommodate screws or rivets. Adhesive backing can be applied, and specified to suit the medium the plate will be adhered to. In some instances, plates are mounting directly onto the equipment they are intended for by welding.